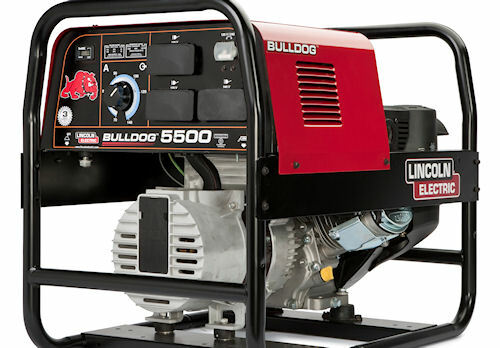 Lincoln Electric's new Bulldog 5500 is a stick welder and portable generator all in one. Emergency power and portable stick welding -- up to 140 amps -- is available in Lincoln Electric's new Bulldog 5500 portable welder/generator. The Bulldog 5500 is designed exclusively for AC stick welding on steel, stainless steel, cast iron and hardfacing projects with up to 1/8" stick electrodes. It also features a single, full-range calibrated welding control that includes operating ranges fro 3/32" and 1/8" electrodes. Emergencies and convenience are both served well in Lincoln Electric's new Bulldog 5500 portable welder/generator. The unit provides 4 Kw continuous power and is capable of 140 amp output welding. Powered with a Kohler 9.5 horsepower CH395 overhead cam gasoline engine, the 5500 can be run 100 hours between scheduled oil changes. The OHC single cylinder power plant has a cast iron cylinder liner, automatic shutdown for low oil levels, and a three-year warranty from Kohler. The generator portion of the 5500 is capable of surge power to 5.5 Kw (4 Kw continuous) and is capable of powering Lincoln's Power Mig 140C MIG welder with the proper adapters. For more information on Lincoln's new Bulldog, visit www.lincolnelectric.com or call (216) 481-8100 and ask for bulletin E6.32.